A paper by Alexander Buchholz (CREST) and Nicolas Chopin (CREST) on quasi-Monte Carlo methods for ABC is going to appear in the Journal of Computational and Graphical Statistics. I had missed the opportunity when it was posted on arXiv and only became aware of the paper’s contents when I reviewed Alexander’s thesis for the doctoral school. The fact that the parameters are simulated (in ABC) from a prior that is quite generally a standard distribution while the pseudo-observations are simulated from a complex distribution (associated with the intractability of the likelihood function) means that the use of quasi-Monte Carlo sequences is in general only possible for the first part. The ABC context studied there is close to the original version of ABC rejection scheme [as opposed to SMC and importance versions], the main difference standing with the use of M pseudo-observations instead of one (of the same size as the initial data). This repeated version has been discussed and abandoned in a strict Monte Carlo framework in favor of M=1 as it increases the overall variance, but the paper uses this version to show that the multiplication of pseudo-observations in a quasi-Monte Carlo framework does not increase the variance of the estimator. (Since the variance apparently remains constant when taking into account the generation time of the pseudo-data, we can however dispute the interest of this multiplication, except to produce a constant variance estimator, for some targets, or to be used for convergence assessment.) L The article also covers the bias correction solution of Lee and Latuszyǹski (2014). Due to the simultaneous presence of pseudo-random and quasi-random sequences in the approximations, the authors use the notion of mixed sequences, for which they extend a one-dimension central limit theorem. The paper focus on the estimation of Z(ε), the normalization constant of the ABC density, ie the predictive probability of accepting a simulation which can be estimated at a speed of O(N⁻¹) where N is the number of QMC simulations, is a wee bit puzzling as I cannot figure the relevance of this constant (function of ε), especially since the result does not seem to generalize directly to other ABC estimators. A second half of the paper considers a sequential version of ABC, as in ABC-SMC and ABC-PMC, where the proposal distribution is there based on a Normal mixture with a small number of components, estimated from the (particle) sample of the previous iteration. Even though efficient techniques for estimating this mixture are available, this innovative step requires a calculation time that should be taken into account in the comparisons. The construction of a decreasing sequence of tolerances ε seems also pushed beyond and below what a sequential approach like that of Del Moral, Doucet and Jasra (2012) would produce, it seems with the justification to always prefer the lower tolerances. This is not necessarily the case, as recent articles by Li and Fearnhead (2018a, 2018b) and ours have shown (Frazier et al., 2018). 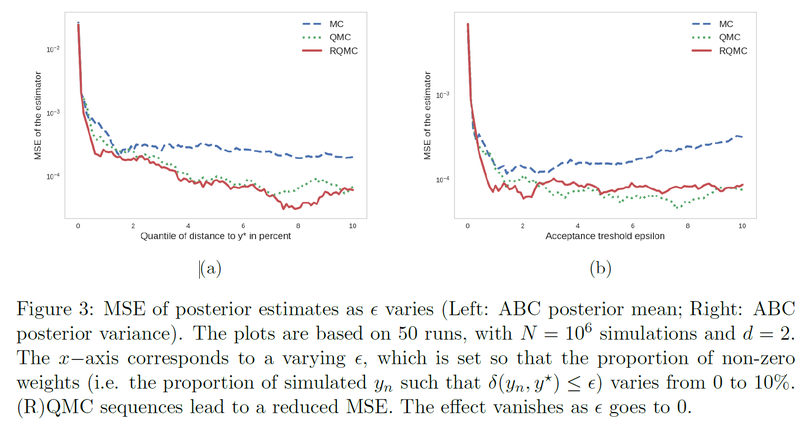 Overall, since ABC methods are large consumers of simulation, it is interesting to see how the contribution of QMC sequences results in the reduction of variance and to hope to see appropriate packages added for standard distributions. However, since the most consuming part of the algorithm is due to the simulation of the pseudo-data, in most cases, it would seem that the most relevant focus should be on QMC add-ons on this part, which may be feasible for models with a huge number of standard auxiliary variables as for instance in population evolution. This entry was posted on November 5, 2018 at 12:18 am and is filed under Books, Kids, Statistics, University life with tags ABC, ABC-PMC, ABC-SMC, CREST, JCGS, PhD thesis, population genetics, population Monte Carlo, qMC, quasi-Monte Carlo methods, variance reduction. You can follow any responses to this entry through the RSS 2.0 feed. You can leave a response, or trackback from your own site.